What is Self Defense – Read on and Find Out! NOTE: This information is provided as general advice only. We recommend proper training in self defense when possible. 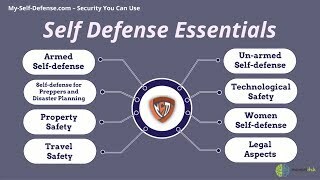 What is Self Defense? This is a question that could have many answers and could vary person by person. Defenition: Self Defense – is a term used to describe the actions taken by an individual to evade or prevent harm inflicted by another individual or group of individuals. You may still be asking what is self defense and we will do our best to provide you with your answer. Self defense can be broken down into 3 different catagories. Self Defense Awareness is the state of mind you should be in at all points of time. When you keep a self defense state of mind you will keep yourself out of dangerous situations and potentially life threatening. Avoiding bad situations and keeping alert of your surroundings is the key to self defense awareness. Self Defense Techniques are the skills required when you do manage to get into a life threatening situation. A good self defense class or learning a form of karate will allow you to keep yourself safe when attacked. Self Defense Devices and products give you the edge you need to stay safe and get away. If all else fails there are many items that will work effectively to take down your attacker without causing permanent damage or risking their life. A good self defense spray or taser gun will take an attacker to the ground in less than a second. The use of all self defense areas listed above will give you a huge advantage if the time ever comes that you are in danger. Take the time and spend a little money to not only find out what self defense is and means, but to find out how it feels to actually be safe.